That was fast! The International Astronomical Union (IAU) has approved all of the proposed names that China submitted for the features at or near Chang’e-4 landing site. Compare this fast action with the IAU’s approval process for the names the New Horizons team picked for both Pluto and Ultima Thule. It took the IAU more than two years to approve the Pluto names, and almost three years to approve the Charon names. It is now almost two months after New Horizons’ fly-by of Ultima Thule, and the IAU has not yet approved the team’s picks for that body. Yet it is able to get China’s picks approved in less than a month? Though it is obviously possible that there is a simple and innocent explanation for the differences here, I think this illustrates well the biases of the IAU. Its membership does not like the United States, and works to stymie our achievements if it can. This factor played a part in the Pluto/planet fiasco. It played a part in its decision to rename Hubble’s Law. And according to my sources, it was part of the background negotiations in the naming of some lunar craters last year to honor the Apollo 8 astronauts. The bottom line remains: The IAU has continually tried to expand its naming authority, when all it was originally asked to do was to coordinate the naming of distant astronomical objects. Now it claims it has the right to approve the naming of every boulder and rock anywhere in the universe. At some point the actual explorers are going to have to tell this organization to go jump in a lake. The New Horizons science team has released mosaic global images of Pluto and Charon, calibrated to capture their true colors as closely as possible. 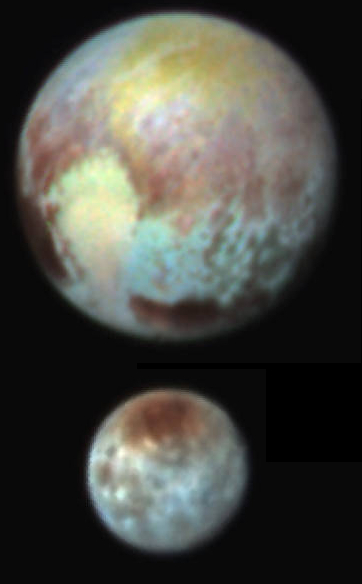 These natural-color images result from refined calibrations of data gathered by New Horizons’ Multispectral Visible Imaging Camera (MVIC).”That processing creates images that would approximate the colors that the human eye would perceive – bringing them closer to ‘true color’ than the images released near the encounter,” said Alex Parker, a New Horizons science team co-investigator from Southwest Research Institute, Boulder, Colorado. Because MVIC’s color filters don’t closely match the wavelengths sensed by human vision, mission scientists applied special processing to translate the raw MVIC data into an estimate of the colors that the eye would see. The colors are more subdued than those constructed from the raw MVIC color data, because of the narrower wavelength range sensed by the human eye. Both images were taken as New Horizons zipped toward closest approach to Pluto and its moons on July 14, 2015; Charon was taken from a range of 46,091 miles (74,176 kilometers) and Pluto from 22,025 miles (35,445 kilometers). Each is a single color MVIC scan, with no data from other New Horizons imagers or instruments added. The striking features on each are clearly visible, from Charon’s reddish north-polar region known as Mordor Macula, to the bright expanse of Pluto’s, nitrogen-and-methane-ice rich “heart,” named Sputnik Planitia. I must add that these images show only one hemisphere, since the New Horizons flyby did not get a good look at the opposite hemisphere. We won’t know what the other half of both planets look like for many decades. Using data and images from New Horizons scientists have now produced the first global topographic maps of Pluto and Charon. These maps reveal a rich variety of landforms on both Pluto and Charon. 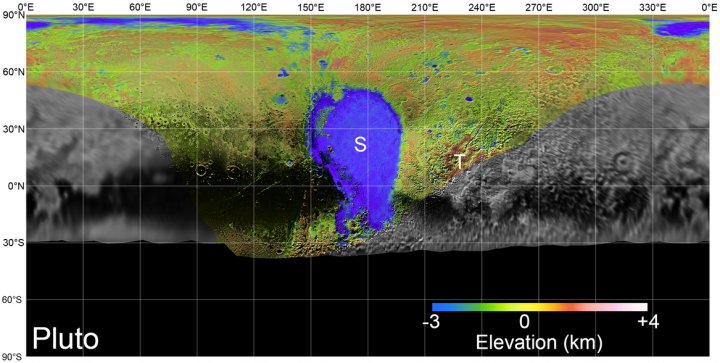 The topographic maps confirm that the highest known mountains on Pluto are the Tenzing Montes range, which formed along the southwestern margins of the frozen nitrogen ice sheet of Sputnik Planitia. These steep-sided icy peaks have slopes of 40° or more and rise several kilometers above the floor of Sputnik Planitia. The highest peak rises approximately 6 kilometers (3.7 miles) above the base of the range, comparable to base-to-crest heights of Denali in Alaska, and Kilimanjaro in Kenya. Pluto’s mountains must be composed of stiff water ice in order to maintain their heights, as the more volatile ices observed on Pluto, including methane and nitrogen ice, would be too weak and the mountains would collapse. The topographic maps also reveal large-scale features that are not obvious in the global mosaic map. The ice sheet within the 1000-kilometer (625-mile) wide Sputnik Planitia is on average 2.5 kilometers (1.5 miles) deep while the outer edges of the ice sheet lie an even deeper 3.5 km (or 2.2. miles) below Pluto’s mean elevation, or ‘sea level’ surface. While most of the ice sheet is relatively flat, these outer edges of Sputnik Planitia are the lowest known areas on Pluto, all features that are evident only in the stereo images and elevation maps. 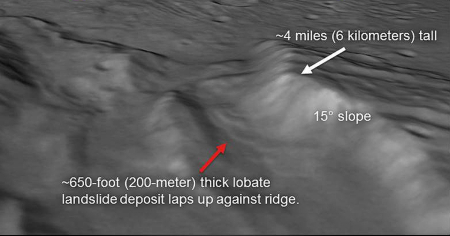 The topographic maps also reveal the existence of a global-scale deeply eroded ridge-and-trough system more than 3000 kilometers (or 1864 miles) long, trending from north-to-south near the western edge of Sputnik Planitia. 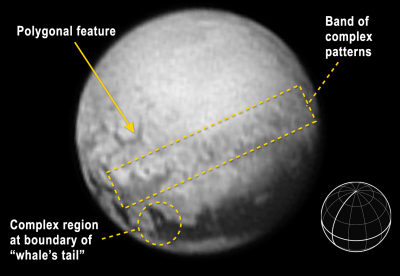 This feature is the longest known on Pluto and indicates that extensive fracturing occurred in the distant past. Why such fracturing occurred only along this linear band is not well understood. These maps are obviously only our first stab at mapping both planets. We will need orbiters around both to truly detail their surface features. The New Horizons science team has released the best maps of both Pluto and Charon possible from the images taken during the spacecraft’s fly-by of the ninth planet last year. The new maps include global mosaics of Pluto and Charon, assembled from nearly all of the highest-resolution images obtained by New Horizons’ Long-Range Reconnaissance Imager (LORRI) and the Multispectral Visible Imaging Camera (MVIC). These mosaics are the most detailed and comprehensive global views yet of the Pluto and Charon surfaces using New Horizons data. The new collection also includes topography maps of the hemispheres of Pluto and Charon visible to New Horizons during the spacecraft’s closest approach. The topography is derived from digital stereo-image mapping tools that measure the parallax – or the difference in the apparent relative positions – of features on the surface obtained at different viewing angles during the encounter. Scientists use these parallax displacements of high and low terrain to estimate landform heights. You will also notice large areas of both Pluto and Charon that remain very fuzzy and unclear. What exactly is there will remain a mystery for many decades to come. Images from New Horizons have detected evidence of past avalanches on Pluto’s largest moon, Charon. The image on the right is a reduced version of a perspective view created using data from various instruments. This perspective view of Charon’s informally named “Serenity Chasm” consists of topography generated from stereo reconstruction of images taken by New Horizons’ Long Range Reconnaissance Imager (LORRI) and Multispectral Visible Imaging Camera (MVIC), supplemented by a “shape-from-shading” algorithm. The topography is then overlain with the PIA21128 image mosaic and the perspective view is rendered. The MVIC image was taken from a distance of 45,458 miles (73,159 kilometers) while the LORRI picture was taken from 19,511 miles (31,401 kilometers) away, both on July 14, 2015. 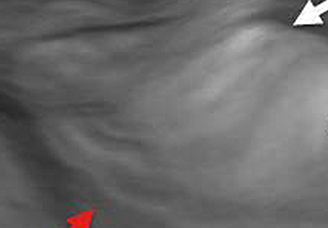 To the left is a close-up taken from the annotated image. You can see the slump materials at the base of the mountain left behind after the material slide down the mountain. It is not clear whether it is Charon’s lower gravity and alien composition and environment (very very very cold) that makes this look more muddy than one would expect, or whether it is because of the limited resolution of the original image and the modeling to create the oblique version. Charon’s red polar region explained? Scientists, using data from New Horizons as well as new computer models, think they have come up with an explanation for the red polar region of Pluto’s moon Charon. As they detail this week in the international scientific journal Nature, Charon’s polar coloring comes from Pluto itself – as methane gas that escapes from Pluto’s atmosphere and becomes “trapped” by the moon’s gravity and freezes to the cold, icy surface at Charon’s pole. This is followed by chemical processing by ultraviolet light from the sun that transforms the methane into heavier hydrocarbons and eventually into reddish organic materials called tholins. A frozen underground ocean on Charon? Data from New Horizons of the surface of Pluto’s moon Charon now suggests that the satellite once had an underground ocean that is now frozen. The New Horizons science team has released new high resolution images of Pluto’s moon Charon, including the global enhanced color view on the right. In many ways these images remind me of an upside-down Mars, with the smooth lower plains in the south instead of the north. Obviously, the causes on Charon are going to be significantly different than those on Mars. As they await the arrival of more data from New Horizons, the science team have highlighted this interesting and entirely puzzling feature revealed in their first global image from Charon, shown in the image on the right, a mountain inside a depression. Note also the nearby rill-like depressions running from one crater to the next. My first thought is that the mountain, which in this relatively low resolution image looks almost like a really gigantic boulder, is made of material denser than the ground in which it sits, and some heating event caused the ground to soften and collapse, dropping the mountain-sized boulder down into the sinkhole. I am guessing of course. What we have here is a very alien environment, with geological processes in temperatures and densities and gravities to which we are wholly unfamiliar. What we would normally expect to happen is not something we should expect to normally happen on either Charon or Pluto. Many cool images! I will only post one, on the right, of the ice mountains seen at the southernmost edge of Tombauh Regio. More can be seen here. They have gotten good data on Pluto’s atmosphere. Earlier data just before fly-by suggested that there are specific regions on the surface that have a lot of methane, but with different properties depending on location. They have found that the surface of Charon is active. 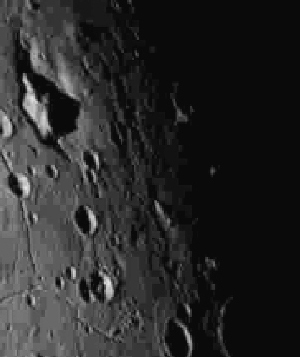 It also looks like a weird Moon, cratered, with a dark mare region they have dubbed Mordor. Its cause however is not the same as the Moon. There are also a large sequence of troughs and cliffs that are unlike other planets. Some areas are very smooth, as they they have been repaved after cratering. And there is a canyon that is very very deep, 3 miles deep, that makes it relatively deeper than any other canyon in the solar system. Pluto’s moon Hydra is not spherical, and in fact looks like an asteroid. The white heart is now been named Tombaugh Regio after one of Pluto’s discoverers. In its southern extent there are mountains and strange pits. And this area has no impact craters, meaning this is a very young surface, less than 100 million years old. The mountains have to made of ice, which is essentially the only thing that can be bedrock at Pluto’s temperatures, based on what they think Pluto is composed of. The data shows repeatedly that a tiny planet can still have geological activity after billions of years, even without a giant gas giant nearby to produce tidal heating. They have named the giant whale-shaped dark region at the equator Cthulu Regio. The data and images will be coming back from New Horizons for the next year, so the show is certainly not over. While waiting for word about how New Horizons has fared during its close fly-by of Pluto, the science team today released the false color images on the right of both Pluto and Charon to illustrate the complicated surface geology of both planetary bodies. Word on the spacecraft’s status will arrive at around 9 pm (eastern) tonight. Images and data will then follow, assuming all is well. Cool image time! The New Horizons science team released another image of Pluto on Friday, this time showing enough details that they can begin to see geological features. “Among the structures tentatively identified in this new image are what appear to be polygonal features; a complex band of terrain stretching east-northeast across the planet, approximately 1,000 miles long; and a complex region where bright terrains meet the dark terrains of the whale,” said New Horizons principal investigator Alan Stern. Be sure to click on the link to see the full resolution version of the image. The New Horizons science team today released a new image showing both Pluto and Charon, and not unexpectedly, they are very different from each other. A high-contrast array of bright and dark features covers Pluto’s surface, while on Charon, only a dark polar region interrupts a generally more uniform light gray terrain. 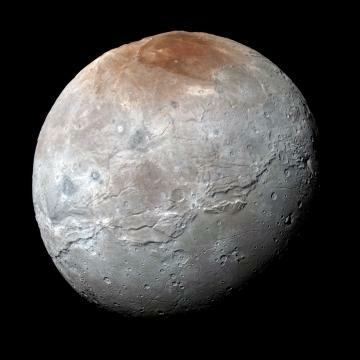 The reddish materials that color Pluto are absent on Charon. Pluto has a significant atmosphere; Charon does not. On Pluto, exotic ices like frozen nitrogen, methane, and carbon monoxide have been found, while Charon’s surface is made of frozen water and ammonia compounds. The interior of Pluto is mostly rock, while Charon contains equal measures of rock and water ice. “These two objects have been together for billions of years, in the same orbit, but they are totally different,” said Principal Investigator Alan Stern of the Southwest Research Institute (SwRI), Boulder, Colorado. For a half century, since the first probes left Earth to visit other worlds, the one consistent axiom we have learned from every mission is that no two objects are going to be alike, and that every object out there is going to be incredibly unique. Pluto and Charon, in finishing the human race’s first inventory of the solar system, prove this axiom once again. In anticipation of their discovering many previously unseen features on both Pluto and Charon, the New Horizons science team released today a proposed list of names, including “Kirk”, “Spock”, and many other fictional science fiction characters. Many of these suggestions were proposed by the public. Personally, I prefer the part of their proposal where they suggest naming features after real people, like Lewis Carroll and Arthur Clarke. Using the first color images sent from New Horizons, scientists have assembled a short movie of the orbital dance between Pluto and its largest moon Charon. 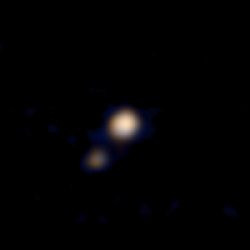 Getting closer: The New Horizons science team has released the spacecraft’s first color image of Pluto and its moon Charon, taken on April 9. 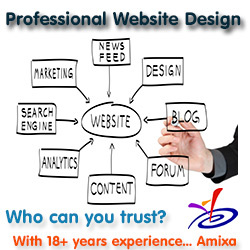 The image is to the right. 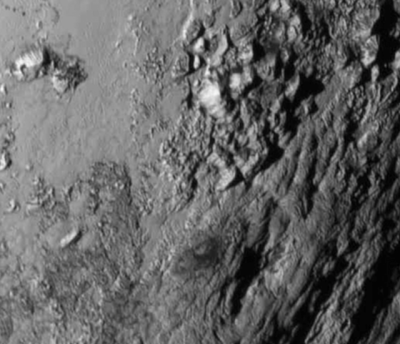 Right now Pluto is really not much more than a blob a few pixels across. However, images like this, taken in conjunction with later images, are useful to help refine the spacecraft’s course. Cool images! Using New Horizons’ long range camera scientists have compiled a movie showing Charon and Pluto orbiting each other during the last week of January 2015. Pluto and Charon were observed for an entire rotation of each body; a “day” on Pluto and Charon is 6.4 Earth days. The first of the images was taken when New Horizons was about 3 billion miles from Earth, but just 126 million miles (203 million kilometers) from Pluto—about 30% farther than Earth’s distance from the Sun. 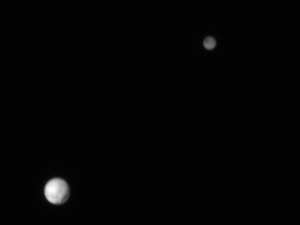 The last frame came 6½ days later, with New Horizons more than 5 million miles (8 million kilometers) closer. 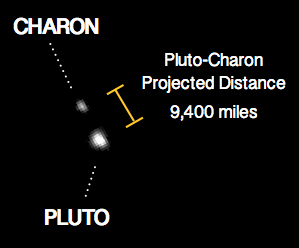 Our view of Pluto, and Charon, is only going to get better as New Horizons zooms towards its July fly-by. The New Horizons science team has finally released the navigation image of Pluto and Charon that the spacecraft took on January 25. A cropped version is on the right. The image shows Pluto and its biggest moon Charon, with both appearing somewhat elongated in shape. Why this is so is not explained by the press release, but I suspect it is because the goal of the image was not sharpness but to locate the planet for navigation purposes. In anticipation of its fly of Pluto next year, the New Horizon spacecraft has produced a 12 frame movie showing Pluto’s moon Charon circling the planet. Hubble has discovered a fourth moon orbiting Pluto.